2.5 years ago I bought lower control arms for my 2009 Carrera S in order to get more negitive camber. 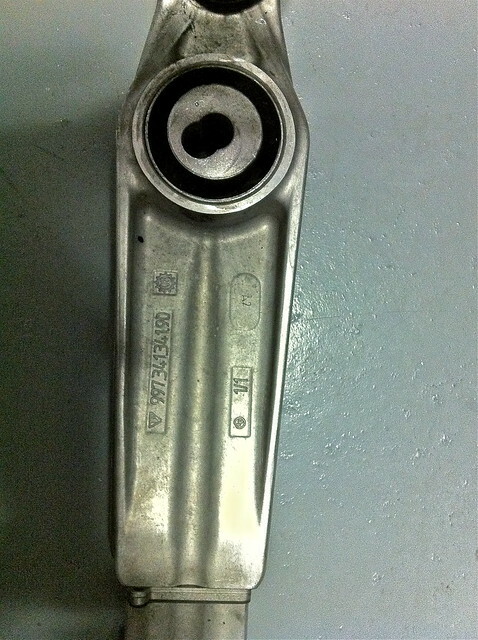 I just found out what I actually have is GT3 CUP Lower Control arms with rubber bushings part # 997.341.341.90. I thought I had regular GT3 Lower Control Arms. After these Cup LCA's were installed I noticed my stock 8x19 wheels were more flush in the wheel well, even with -2.5 camber. Looked great! However my CCW 9x18 track wheels with more offset plus wider than the stock wheels, where pushed further outward and the edge of the 245 or 255 tire I was running was at the edge of the wheel well. I plan on transfering these Cup LCA's to my Carrera GTS and am going through a devil of a time with figuring out the correct offset for new wheels for the front. When I asked what the difference between GT3 LCA's and GT3 CUP LCA's is I was told the Cup LCA's are longer than regular GT3 LCA's. What do you all think? Should I keep using the CUP LCA's or sell them and get GT3 LCA or just get a wheel with a less aggressive offset for the front? i would keep cup arms and in case if you want make tire to dive in deeper into wheel well you can replace stock gts upper mounts with GT3 steel monoball mounts which can be rotated - that will move shocks and a wheel a bit inside and will allow to use less shims for same amount of camber. if 255 tire does not rub at inner liner in a turn i would not worry anyway. it may look as tire is on same line with fender but at 2.5 deg camber it will dive inside just fine. Last edited by utkinpol; 08-04-2011 at 05:29 PM. Wood baseball bat and work the front fender as needed. It is very, very easy to slightly pull out the front fender / bend the front fender lip to buy yourself that needed mm or two or three or four. Seriously, wood bat, just maneuver it between the rubber tire and fender and then very slowly and methodically on a warm / hot day, just lever the fender edge away from the tire if needed. Not sure if the GTS has the GT3 turnable top struts to start negative camber at 1.5-1.8, but that would buy you all the room you needed as it shifts the entire shock inboard. just don`t forget to call video crew to film the process of doing it on a brand new GTS car. 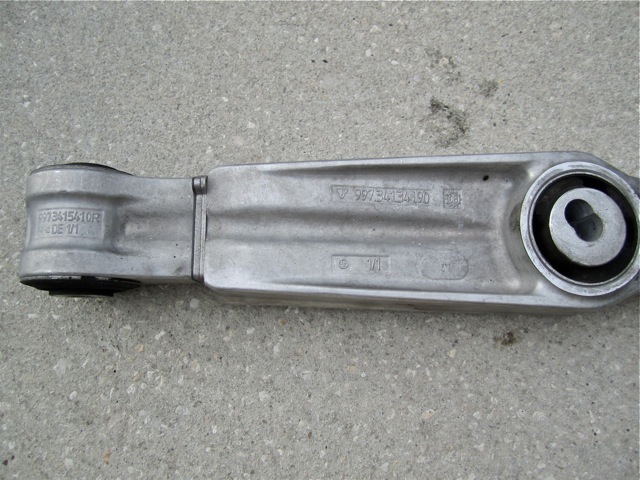 Cup parts have the wishbone assembly in pieces. 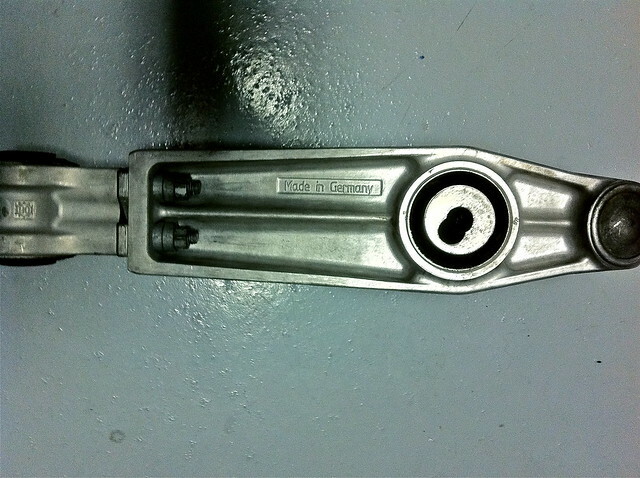 This for example is the part number for the outside of the right arm. In the 6GT3s the cup part numbers and street car part numbers for the arms were exactly the same, and both were sold as individual pieces. I don't know if in the 7 cars, the arms have a different length, but surely they do have a different part number as the PET gives one number for the complete assembly vs the cup parts list were the arms are shown in pieces. Btw did you use shims ? Normal people have no idea about cars - let alone GT3 owners that go to the track. I should actually film some of the faces of people that slow their cars as they pass my house when the car is on jack stands with no tires. yep, my neighbors also enjoy the process when i take car apart from time to time - seats, wheels, under car panels, etc. still, mine is used '06 C2 so it is quite less brain screwing than to do it to brand new $120K chassis. i am slowly preparing my wife to idea that this car will end up gutted with full cage in it. as of weak M96 motor - I do not care much about that as long as suspension is great. this car is a lot of fun to drive.... only issue is to win a major domestic fight to find a spot to park a trailer for it. it is not going to happen soon, she is quite against it. and she would never let me do such thing to brand new car. 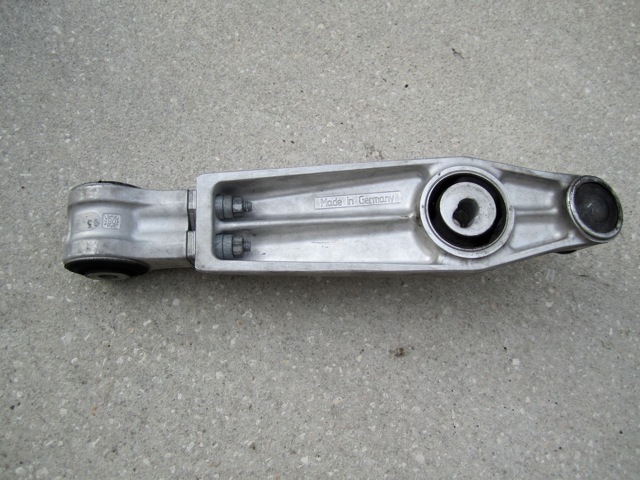 Yes used shims...part number on these is correct as listed 997.341.341.90...here is what I have. Can you rotate the struts on your CS? I don't know...how do I know if I can? From what i know is that the RSR arms are longer than the stock GT3.. I dont know about the cup arms.. If you are going to do the baseball trick, I would suggest you get some tin snips and cut the inside of the lip every 2 inches before rolling the lip in. I did it this way to my 88 Club Sport on the recommendation of a fellow Porsche nut and one could never see from the exterior what had been done. Think I wanted to go from 205's to 225's up front! Guy's...I don't understand the baseball bat trick nor am I going to attempt it....I think he was joking anyway...but ya never know with some of you guys on this forum.